The total value of insurance claims for the November Kaikōura earthquake as at 31 August 2017 is over $2 billion; the majority of losses are from $1.48 billion in commercial claims, while residential claims amount to nearly $0.55 billion, according the Insurance Council of New Zealand. Private insurers have received nearly 44,000 claims, 32,000 of which are for residential properties. Insurance Council of NZ Chief Executive Tim Grafton, commented; “2017 has been a huge year for New Zealand with earthquakes, floods and fires hitting us hard. 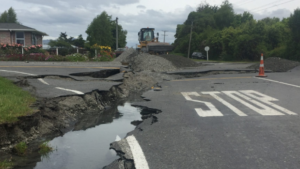 Currently 59% of residential and commercial claims have been settled; insurers say they’ve committed to having settled 90% of Kaikoura earthquake and Edgecumbe flood claims by the end of 2017. The devastating 7.8 magnitude November earthquake caused parts of the Kaikoura Coast to rise up to 6 metres – causing significant damage to the coastline. These claims and costs do not include any claims that the Earthquake Comission is managing for the Kaikōura earthquake nor where insurance has been purchased off-shore.